New survey report highlights steady overall application volumes as regional shifts in demand continue to shape the market. Overall application volumes to graduate business programs in 2018 are steady as regional shifts in demand continue to shape the market, according to the findings of the Application Trends Survey Report 2018, published today on gmac.com. Application volumes to graduate business programs in Asia Pacific, Europe, and Canada are up compared with last year, while application volumes to US programs are down. A total of 1,087 graduate business school programs at 363 business schools worldwide participated in this year’s survey—a new record. Overall, about half of programs (48%) report growing or stable application volumes this year compared with last year. The total number of applications received by the subset of programs that participated in both this year’s and last year’s surveys is virtually unchanged year-on-year (-0.02%). 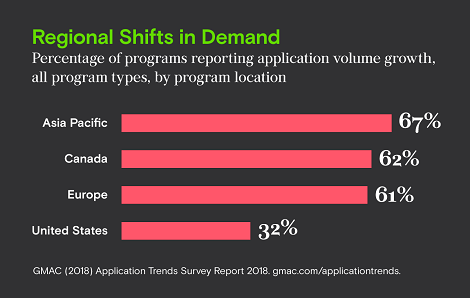 Most programs report increases in applications volumes this year in Asia Pacific (67% of programs), Canada (62%), and Europe (61%), while most programs in the United States report declines (59%). The analysis shows that international student mobility remains a key determinant for business school programs’ application volumes. Strong application volumes to programs in Canada and Europe this year are driven primarily by international demand, as more than half of programs in these regions report international application increases this year, compared with less than half that report domestic application increases. Most programs in the United States report declines in international applications this year, while domestic application trends are mixed across program types. Application increases to Asia-Pacific programs this year are driven primarily by domestic demand. This Wednesday, October 3, at 12 pm ET, GMAC researchers will host a complimentary webinar to present the findings of the survey and answer questions from attendees. The 45-minute presentation will cover the survey’s key findings and examine application trends by program type and location, including additional analyses not featured in the summary report. Following the live broadcast, all webinar registrants will be emailed a link to the webinar recording and slides. 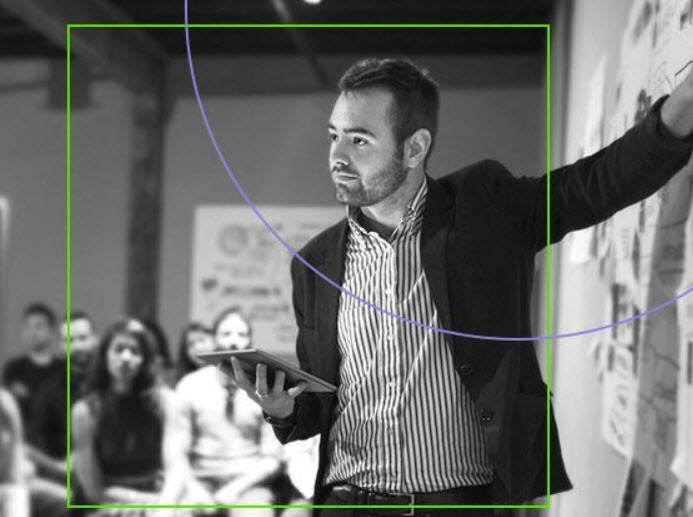 The overall volume of applications to MBA programs is stable. The total number of applications received by MBA programs that participated in both this year’s and last year’s surveys is virtually unchanged year-on-year (+0.04%). Most US MBA programs of all types report declines in application volumes this year, including full-time two-year MBA programs (70% of programs report declines) and full-time one-year MBA programs (53%). Most full-time two-year MBA programs in Asia Pacific report increases in applications this year (75%), while about equal shares of European full-time one-year MBA programs report application increases (45%) and decreases (42%). Most European Master in Management (66%) and Master of Finance (75%) programs report growing application volumes this year. The majority of US Master in Management (71%), Master of Finance (57%), and Master of Accounting (68%) programs report application volume declines this year. US Master of Data Analytics programs continue to expand in 2018, with most reporting application volume growth this year (64% of programs). For more, including this year’s survey infographic and previous year’s summary reports, visit gmac.com/applicationtrends.